Victreebel in game: 527 Who? Important notice! Pokemon Victreebel is a fictional character of humans. Victreebel (Japanese: ウツボット Utsubot) is a dual-type Grass/Poison Pokémon introduced in Generation I. It evolves from Weepinbell when exposed to a Leaf Stone. It is the final form of Bellsprout. 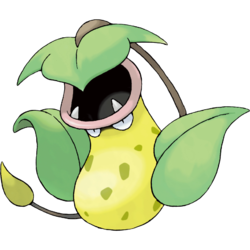 Victreebel has a bell-shaped body with a gaping mouth that has two sharp teeth. Its semicircular eyes appear directly under its mouth and it has several dark green spots on its body. 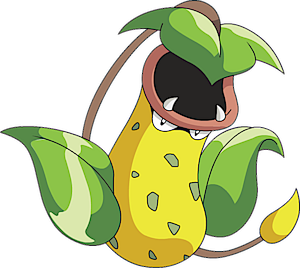 Covering Victreebel's mouth is a leaf with a long, brown, yellow-tipped vine growing out of it. The vine is flicked to mimic an animal in order to attract prey. Victreebel also produces a sweet scent to further aid in luring its victims. Acid that has dissolved numerous prey animals becomes sweeter and even more effective at attracting prey. It can be found in small groups and is territorial. In the manga, Victreebel has been shown to hoard food, usually small birds and rodents, and collect Leaf Stones to perform evolution rituals at night to help Weepinbell become more Victreebel. Victreebel lives in forests. James had two separate Victreebel (traded for each other in Here's Lookin' at You, Elekid), both of which evolved from Weepinbell while in his possession. His second Victreebel was expelled from the group by Jessie after it attacked her. It landed near his first Victreebel, both Pokémon fell instantly in love, and they hopped off together into the forest. They have not been seen since. A Victreebel made an appearance in Danger, Sweet as Honey!. Multiple Victreebel appeared in Thawing an Icy Panic!, where they were attacking Clemont who broke the fence of Ramos' ranch and one of them was trying to eat him. 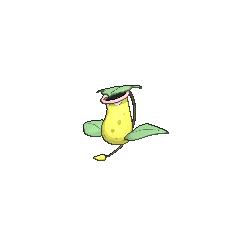 Victreebel first appeared in Pokémon Scent-sation!. Victreebel also appeared in The Kangaskhan Kid. A Victreebel appeared in The Battling Eevee Brothers. Victreebel also appeared in The Power of One. A Victreebel also appeared in Celebi: Voice of the Forest and Pokémon Heroes: Latios & Latias. A Victreebel appeared in the opening of Lucario and the Mystery of Mew. Multiple Victreebel made brief cameo appearances in Destiny Deoxys and Giratina and the Sky Warrior. A Victreebel made a cameo in Arceus and the Jewel of Life. 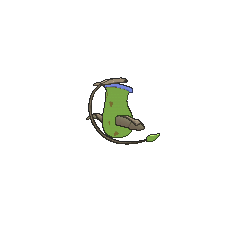 A Trainer's Victreebel appeared in Under the Pledging Tree!. Red's Victreebel appeared in File 3: Giovanni. It went up against Giovanni's Rhyhorn and lost. In Long Live the Nidoking!, Red was caught by a wild Victreebel in the Safari Zone. 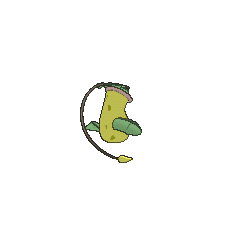 In the next round, A Hollow Victreebel, he was to be used as food in an evolutionary ritual for several Bellsprout and Weepinbell. He used a Poké Flute and a Poké Doll to disrupt the ritual and escape. In the process, he captured a Victreebel, which he used to battle the Nidoking that was after him. By morning, Red had captured several Safari Zone Pokémon, including multiple Victreebel. Erika also has a Victreebel which first appeared as a Bellsprout during her battle with Red in Meanvile Vileplume! it evolved into a Victreebel prior to Whacked by Marowak!. In Three Cheers for Chikorita, Crystal manages to catch a Victreebel in her quest to fill the Pokédex. During the fight, Elm's Chikorita comes looking for Crystal, prompting Victreebel to sneakily use Chikorita as a living shield to defend itself from Arcanine's Fire-typeattacks. Another Victreebel was one of the Pokémon sent to help the fight in Ilex Forest in The Last Battle XIII. Lures prey with the sweet aroma of honey. Swallowed whole, the prey is melted in a day, bones and all. Attracts prey with sweet-smelling honey. Its prey include bugs, naturally, and even large animals on occasion. This horrifying plant Pokémon attracts prey with aromatic honey, then melts them in its mouth. Once ingested into this Pokémon's body, even the hardest object will melt into nothing. The long vine extending from its head is waved about as if it were a living thing to attract prey. When an unsuspecting victim approaches, it is swallowed whole. Lures prey into its mouth with a honeylike aroma. The helpless prey is melted with a dissolving fluid. It pools in its mouth a fluid with a honeylike scent, which is really an acid that dissolves anything. Moves marked with a superscript game abbreviation can only be bred onto Victreebel in that game. 51%-100% HP Nothing gets out of my mouth alive! 26%-50% HP Listen, my HP's half gone. Level up Yes, yes, I've leveled up! Victreebel sloshes poison from its big mouth. Beware of the puddled poison! It shoots leaves and slops poison around to attack. 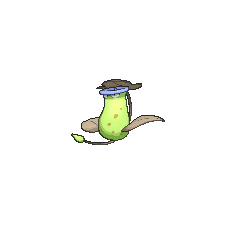 For other sprites and images, please see Victreebel images on the Bulbagarden Archives. In Generation I, Victreebel has the highest index number of all non-glitch Pokémon. Victreebel and its pre-evolutions are based upon carnivorous pitcher plants. Victreebel seems to be a combination of victory (corrupted to make a pun on tree) and bell (referring to its bell-like shape). The maximum number of characters possible to make up a Pokémon's name in Generation I was ten, and this is likely the reason for the misspelling of bell as bel. Utsubot is derived from 靫葛 utsubokazura (pitcher plant). It may also be based on 壷 tsubo (jar) or ポット pot (relative to bot), referring to its shape. It could also draw from botanical. French Empiflor From s'empiffrer and flora. Cantonese Chinese 大食花 Daaihjihfā Means "Flower with big appetite"
Mandarin Chinese 大食花 Dàshíhuā Means "Flower with big appetite"